scrappin it: Guest Blogging for the queen! Guest Blogging for the queen! 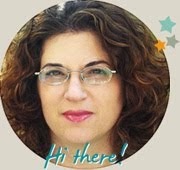 Today I'm really honored and proud to be a guest blogger in Lisa Rojas' blog the Stampin' Queen! Lisa has been a rubber stamp artist and instructor since 1995. She began designing for publication in 2000 with her work appearing in various craft and home decorating magazines including Scrap & Stamp Arts, The Rubber Stamper, Stamp It!, Paperworks, Craft Home & Style, CardMaker, and Aleene's Craft Club. She also has her designs published in several multi-designer books. She loves to design projects with rubber stamps and share thoughts and ideas with fellow designers! Lisa is a CHA Designer Member and A very talented lady. She has magical stampin' hands and she creats beutiful projects! Check out which of my projects she chose to share! Lisa, thanks for having me as a guest on your blog!